Vanilla French Custard Bundt Cake is a smooth, silky and festive dessert with delicious vanilla notes and a perfect soft and tender custard texture. We love making delicious holiday themed desserts. Our other popular once are Walnut Raspberry Linzer Cookies, Neon Chocolate Sugar Cookies and Peppermint Patty Cupcakes. Vanilla French Custard Bundt Cake is the perfect for the holidays, it looks festive and it tastes amazing. The texture is what I love about it. See, I always gush about how much I love creamy, soft desserts, and this cake is so smooth and silky! In France, the batter from this Vanilla French Custard Bundt Cake is usually baked in individual mini cakes, but I just wanted a festive bundt cake, that would capture the beauty of the holiday season. Garnished with a thick, vanilla bean glaze and winter themed sprinkles, this would make a show-stopper dessert! The cake texture is very smooth, infused with vanilla bean flavor with a soft middle and a chewy top. 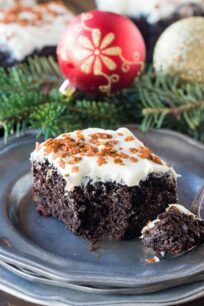 The cake is very creamy thanks to all the heavy cream and egg yolks that are used in this recipe. 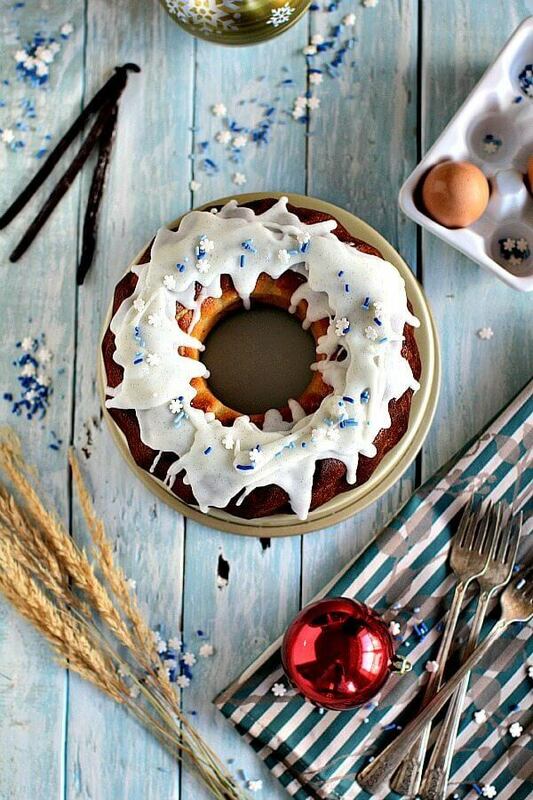 Rich and scrumptious, this holiday themed bundt cake feels like a luxurious end to a holiday meal. First, do not replace the heavy cream with light cream or half and half. Tthis recipe is not where you want to cut on some calories. Also, make sure you sift the flour, otherwise the cake may be not as smooth. Make sure you use room temperature eggs, you will be whisking them with warm-hot cream. If the eggs are very cold, they will curd and cook. When mixing in the cream mixture into the eggs, do it very slowly, as the egg mixture needs to warm up. Otherwise, you may end up “cooking” some of the eggs, and the batter will become unusable. In addition, vanilla beans are very, very expensive. You can skip them in this recipe and use vanilla extract if you want. Please use 1-2 teaspoons of vanilla extract. Based on how much vanilla flavor you prefer in your desserts. The bundt cake can also be made with almond extract and you can top it with a sugar glaze and silvered almonds. Another option is to flavor the bundt cake with peppermint extract and top it with a sugar glaze and finely chopped peppermint candies. 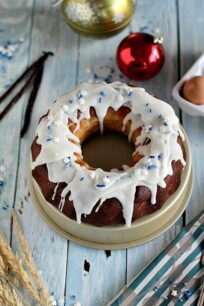 Silicone Bundt Cake – I love using this one, makes cake removal a breeze! Vanilla Beans – these are the ones more reasonably priced, if you decide to splurge and get some for the holidays. Vanilla Extract – if you decide to use the extract instead. In a medium saucepan over medium heat, combine heavy cream, butter and vanilla pods. Cook until the mixture reaches a boiling point. Remove the mixture from heat, discard the vanilla bean pods and let it cool down a bit for about 7-10 minutes. In the meantime, add the sifted flour, sugar and salt to a large bowl and whisk to combine. Add the eggs and egg yolks to the flour mixture, whisk until well combined and the batter is smooth. This can be done using a hand mixer or stand mixer too. Gradually start whisking the heavy cream mixture into the flour and egg mixture, whisking constantly and quick. First add a little bit while mixing, for the eggs to warm up, then keep adding the mixture gradually, while mixing vigorously. Cover the batter with plastic wrap and put in the fridge for at least 1 hour (and up to 12 hours) before baking. Brush a bundt cake silicone mold with melted butter, then place it in the fridge for 30 minutes for the butter to stick. Place the silicon mold on a flat baking pan (cookie pan) before filling it with batter, so it's easier to move into the oven. Pour the batter into the silicone bundt cake and bake for 10-15 minutes at 500F to get the brown caramelized crust. Reduce oven temperature to 360F and bake for 40-45 minutes or until the cake is a deep golden brown color. Check on the cake at 30 minutes, to make sure it doesn't burn. When done, remove cake from the oven and place on a cooling rack to cool down. Once the cake cooled down to room temperature remove it from the mold. The cake will have a deep brown crust with a soft and silky inside. The cake can be stored in the fridge for up to 4-5 days in an airtight container or wrapped in plastic wrap. 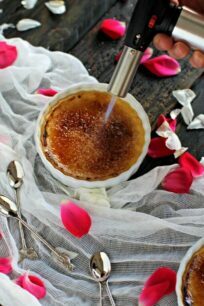 In a small saucepan over medium-low heat, whisk together sugar, milk, and vanilla beans. Glaze should be heated through, but doesn't need to come to a boil. Remove glaze from heat and pour it over the cake, garnish with sprinkles immediately. I recommend using a silicone mold for this cake, makes the removal so much easier. Check on the cake often thru the oven window, to make sure the cake doesn't burn. This is stunning! And the inside looks so custardy and delicious! soo pretty and ready for holidays! Hi Jenna 🙂 yes the reflection 🙂 I love it too haha and if you love custard, I guarantee you that you will like this cake! What a lovely cute little cake! That custardy inside looks so delicious! I always love a nice smooth and silky texture in my bakes! Yes, that texture is my favorite too! Thanks for stopping by Linda. I can’t get over how cute those snowflake sprinkles are ! major awwwww factor going on on my couch looking at this. Thanks Florentina! Would love to send you a slice to enjoy! It looks so pretty with white/blue sprinkles! Thanks Angie, those sprinkles are too cute! Looks delicious and stunning photos!!! Saw you on Frigg! Awe thank you for being so sweet! I just want to dive straight into this recipe. SO yummy! And so perfect for the holidays. Well done! That is one amazing looking bundt cake!! Looks so delicious and I’m sure it tasty even better then it looks. 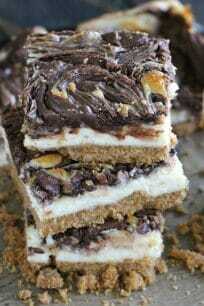 Reminds me of my mom , she use to make this every year for us during the Holiday Season. I may make this bundt cake now to keep her legacy alive with my kids. Me and my siblings couldn’t wait until she was finished so we could eat the homemade icing. YES!!! 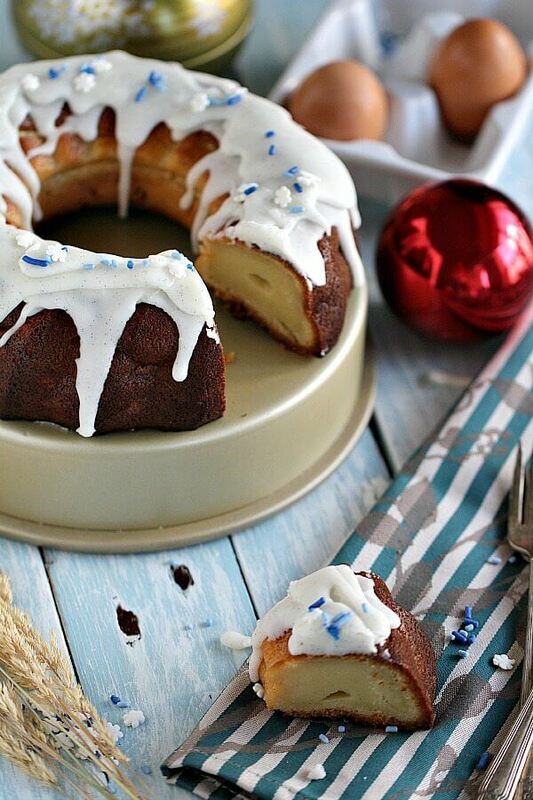 A vanilla French custard bundt cake is perfect and most any holiday guest would love it! I agree no way should we cut calories here! Use heavy cream all the way! I love how pretty yours is decorated too! This looks delicious! And wintry! I’m probably in the minority but blue and white is my favorite Christmas color combo. And thanks for the tips… it’s always helpful to have the info needed for the best chance of recipe success! Wow this looks amazing. One because I am sure that it is , your recipe is probably delicious! The other thing is because your photos are amazing! I need to up my photo game and you have inspired me to do so. I just love how this looks so pretty, lots of style. Thank you for sharing! Soft middle? I am sold! This is a gorgeous bundt cake. Love that it is infused with with vanilla bean. A perfect dessert to take to the next Christmas get together!